More than just a hotel, leisure and golf resort, Tulfarris is one of the most picturesque hotels in Wicklow. Offering delicious food, relaxed bars and deluxe guest bedrooms with spectacular views across Blessington Lakes and the Wicklow Mountains. Located just 45 minutes from Dublin City and 25 mins from the M50, the hotel is easily accessible, ideal for a short break away. The luxurious Wicklow hotel consists of 90 deluxe guest rooms, and 3 self-catering lodges. Choose from executive, superior, suite and manor house with their own unique story and style featuring king-size beds with sumptuous bedding. 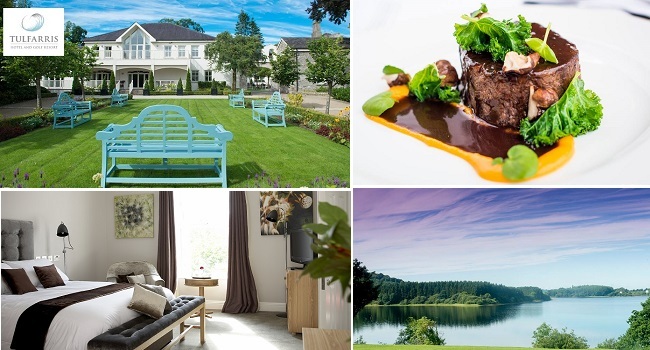 TheTaste are giving readers the chance to Escape to Tulfarris Hotel for a Luxury Overnight Stay for Two with Breakfast, Two Course Dinner and a Glass of Bubbles Each for only €125.